French President François Hollande and Prime Minister Manuel Valls presented to the council of ministers yesterday an amendment inscribing the state of emergency in the French constitution. Even the fragmentary initial reports that emerged from the meeting show that it opened the way to the lasting imposition of police-state rule in France. 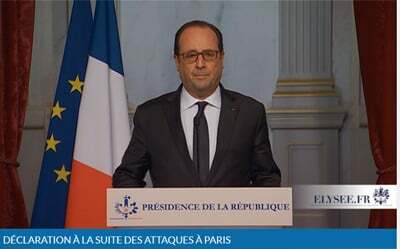 The amendment that Hollande proposed would allow the president to call a state of emergency the duration of which would be set by legislation. The amendment places no restrictions on how long a state of emergency parliamentarians could decide to allow. It also permits a stepped-up use by police of their already enormous powers of repression and electronic surveillance of the population. Moreover, by proposing to extend the deprivation of nationality to dual nationals condemned for “terrorist crimes,” including dual nationals born French, the ruling Socialist Party (PS) is openly affirming its sympathies for the ideas of the neo-fascist National Front (FN). Deprivation of nationality, a policy traditionally advocated by the FN, was employed under the Nazi Occupation amid the French authorities’ participation in the Holocaust. The French state pronounced collective deprivations of French nationality under the Nazi-collaborationist Vichy regime to deprive Jewish refugees in France who had been naturalized of their citizenship. The law of July 22, 1940 deprived 15,154 people of their French citizenship, including approximately 6,000 Jews as well as leaders of the Resistance. Vichy first interned Jews deprived of French citizenship in concentration camps and then, after passing a Franco-German accord on July 2, 1942, began deporting them out of France towards death camps to the east. The proposals by the PS underscore the sharp shift towards the extreme right of the entire political establishment, including its social-democratic components and their pseudo-left satellites, such as the Left Front and the New Anti-capitalist Party in France. These forces defended in 2014 the NATO powers’ decision to back a fascist-led putsch in Kiev and refused this year to travel to Moscow to celebrate the 70h anniversary of the Soviet Union’s victory against Nazi Germany in World War II. Now, the PS government is highlighting its counter-revolutionary historical sympathies inside France itself. Taubira was echoing the position of the PS only a few years ago. In 2010, Valls denounced a debate on imposing new measures on deprivation of citizenship by right-wing President Nicolas Sarkozy as “foul and absurd.” However, Taubira learned upon her return to France that the PS would take a decision on this issue in meetings to which she was not invited. This debate underscores that far deeper political issues are involved in the state of emergency than police matters on how to prevent terrorist attacks. A deep crisis of the capitalist regime is shaking Europe. As austerity devastates workers across the continent, and imperialist wars in the Middle East are provoking growing opposition, the ruling class is pushing for a broad ideological reorientation towards the far right. The PS is appealing to nationalism and racism in order to fashion an ultra-reactionary political consensus that will allow it to continue imposing its unpopular measures. The fact that this operation has produced a return to measures championed by the Vichy regime underscores the immense dangers posed. Hollande was thus proposing to give a blank check for the elimination of freedom of opinion and the installation of a police dictatorship of indefinite duration. Now, the media are seeking to somehow reassure the public that the state of emergency poses no threat to democracy. Hollande’s amendment has been modified, L’ Obs wrote, “after numerous debates.” Several reports indicated that high-ranking judicial officials and legislators had firmly criticized parts of the first text presented by the PS. Valls’ staff insisted yesterday that the new amendment, due to be debated by the National Assembly, would not establish a permanent state of emergency. The council of ministers did not publish the new amendment proposed by Hollande, so it is of course impossible to establish its precise contents. However, the entire political evolution of the PS suggests that it aims to use the law-and-order measures and the political hysteria surrounding the state of emergency to try to crush political opposition inside France and to found an authoritarian regime. The PS banned outright protests against the Gaza war last year and recently against the COP-21 ecological summit, and it is now backing the illegal mass sacking of Sodexo workers in Marseille for striking. Another indication of the character of the PS’ proposals on the state of emergency is the close link that exists between Hollande and the military dictatorship in Egypt. Only a few hours after the November 13 attacks, Hollande received a phone call from General Abdel Fattah al-Sisi to discuss how to fight terrorism. Sisi, who overthrew Muslim Brotherhood President Mohamed Mursi, runs a bloody dictatorship under a state of emergency, citing the threat of Islamist terrorism. He has ordered army units to shoot thousands of unarmed protesters in the streets of Egypt, had police imprison and torture tens of thousands of workers and youth, and had Egypt’s obedient judicial system impose mass death sentences against members of oppositional political parties.